In the inside-the-Beltway world that is Politico’s beat (and one that it mostly covers very well), Mitch McConnell is a titan, whose announced ambition to stay at the top of his party’s Senate conference is big news — Washington’s version of a royal engagement or pregnancy in the U.K. So the long, puffy piece that examines what its headline calls the “record-breaking reign” of the Kentuckian is understandable. And it gives a reasonable account of the intra-party peril McConnell has faced — and overcome, so far — in the Senate. On June 12, McConnell will surpass the 11-plus-year run of former Sen. Bob Dole of Kansas to become the longest-serving Republican Senate leader ever. It’s a remarkable feat given the turmoil in the Republican Party since Trump’s takeover: The House GOP will soon be on its third party leader in little more than three years, while the lower rungs of Senate leadership are about to experience significant turnover. McConnell is on his third president as Republican leader. Yet the 76-year-old Kentuckian is showing no signs of fading away as he steers a 51-seat majority (minus, for now, John McCain) past Dole’s mark. McConnell is serious about running for reelection in 2020, and his colleagues and allies say he’s intent on running for GOP leader again next Congress, regardless of whether Republicans hold the Senate or not. 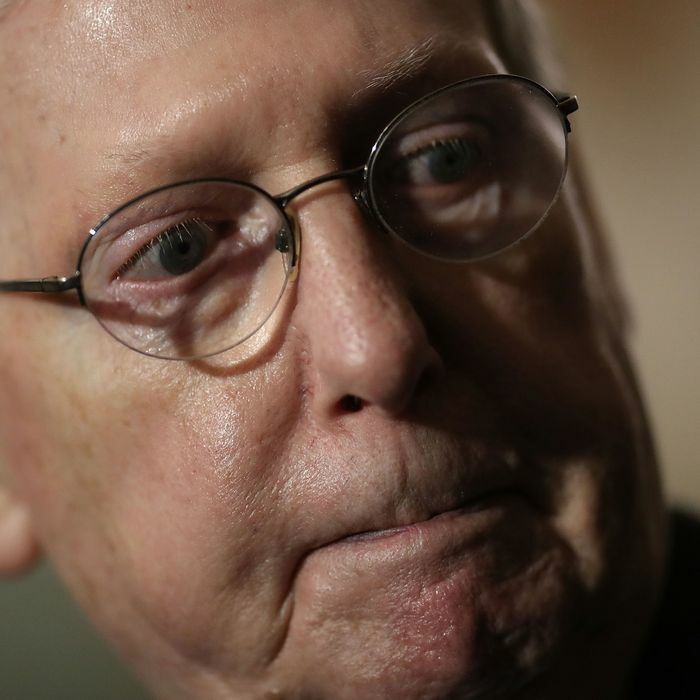 There’s only one small issue missing from this portrait of McConnell as a political royal who can stick around as long as he wants: He has to be reelected every six years (most imminently in 2020), and he is very unpopular among the constituents he represents in the Senate. McConnell has consistently been the least popular senator in the Morning Consult rankings, but he’s closer than ever to breaking even. Those improvements have definitely come to an end. By the end of 2017, McConnell’s approval ratio in Kentucky had dropped to an abysmal 32/53, and Morning Consult had him at 34/52 during the first quarter of 2018 — you know, after his success in finally getting major legislation (the GOP tax bill) through the Senate. To be clear, McConnell is less popular than any of the ten Democrats running for reelection in states carried by Trump whose fate will help determine whether Republicans can hold onto control of the Senate, and he’s less popular than the Republican senators (Bob Corker and Jeff Flake) who were forced into retirement this year by the White House and conservative activists. This does not mean that McConnell is going to lose in 2020. He wasn’t popular in 2014, either, and faced both a formidable primary opponent (Matt Bevin, who later was elected governor) lavishly backed by national conservative groups, and a general election opponent who had recently won statewide (Secretary of State Alison Lundergan Grimes). McConnell’s M.O. in Kentucky is not so much to improve his own image as to drag his opponents down to his own level of unpopularity using his vast fundraising ability. He also has, of course, a general election advantage based on his state’s partisan leanings, which have been trending Republican for a good while. Still, nothing should be taken for granted with respect to the reelection of a figure as unpopular as McConnell. He is and will remain loathed by many conservatives for his indifference to ideology and his willingness to smite them in primaries all over the country. And for Democrats, he is the enduring symbol of everything corrupt and cynical about the GOP; the only cause he seems really to believe in passionately is opposition to anything that even vaguely looks like campaign-finance reform. Maybe he will be able to continue his “reign” at will, but it would be smart of him to be a mite less confident about his standing back home than is Politico.